Few days back, Counterpoint research had created lot of furore after declaring that Micromax had beaten Samsung when it came to overall smartphone market share. Many analyst had discounted that report given stating Counterpoint was new agency and did not have any previous track record. Looks like Analysts were right – leading research agency IDC have released their quarterly numbers which shows that Samsung is still firmly on the top of the heap. Infact, the difference between both the vendors is not that close. Samsung has 17 percent market share compared to Micromax’s 14 percent. Even at current growth, Micromax may take atleast couple of quarters to come close to Samsung. While it is true that Micromax is growing much faster than Samsung, they still have lot of catching up to do. 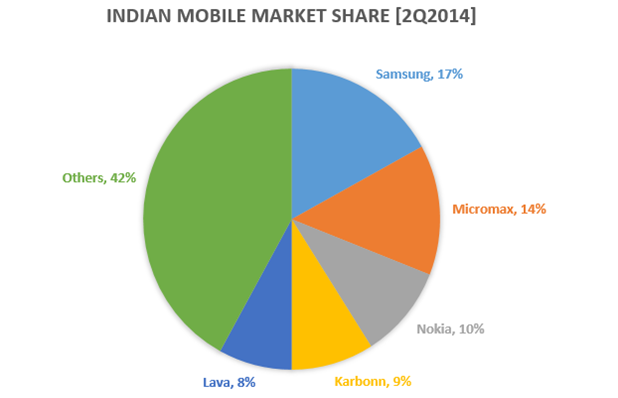 According to IDC, overall India mobile phone market stood at 63.21 million units in Q2 2014, a 5% increase over Q1 2014. 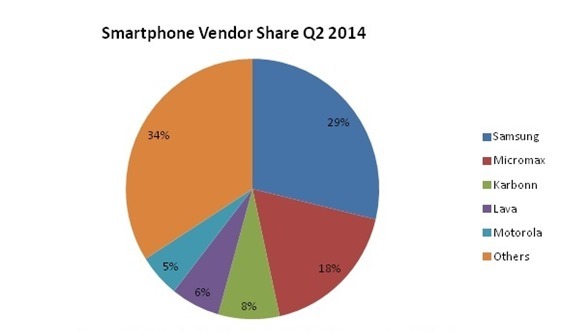 Smartphone market grew much faster at 11% in 2Q2014, compared to 1Q2014. With tremendous influx of ultra-cheap smartphones (we now have smartphones that cost less than 3k), most consumers are moving towards smartphones rather than feature phones. The above graph clearly shows the shift – In second quarter last year smartphones accounted for 16 percent of all the mobile phones. The percentage is now nearly doubled to 29 percent. According to IDC report, vendors shipped a total of 18.42 million Smartphones in Q2 2014 compared to 10.02 million in the same period of 2013. The sub-$200 category of the smartphone market is increasing in terms of new shipment share as the contribution from this category stood at 81% in Q2 2014. 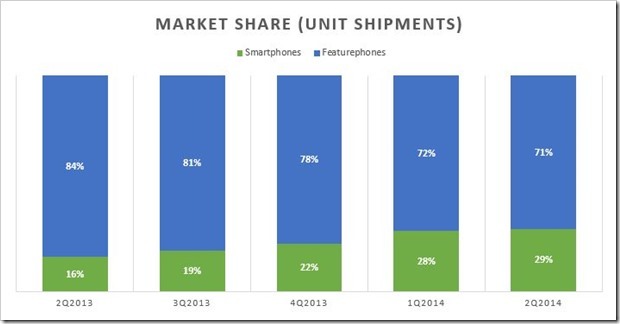 When it came to large screen phones (phablets) the market grew at 5.4 percent quarter on quarter in terms of volume. While in terms of overall mobile market share, the difference between Samsung and Micromax is 3 percentage points, when it comes to smartphones, Samsung is far ahead of Micromax. Former has 29% market share compared to latters 18%. It is true that Micromax is growing faster, and for Samsung to be in the position it is, they need to make sure that they address the low-end of the market aggressively. At one point Samsung brand was synonym with Smartphones, but given the rise of Chinese brands like Xiaomi and Indian brands like Micromax, Karbonn and others, they have now lost their momentum. They surely need to come up with some blockbuster smartphones to regain that momentum back! Reliance Jio Extends ‘Jio Preview Offer’ To More Samsung and LG Phones! Micromax Enters Global Top 10 Phone Maker Club, Samsung Stays At Top! Micromax Entering PC Business & Raising Funds $5B Valuation?